B&H has some deals for customers looking to purchase Sony Xperia smartphones. The devices on sale include the Sony Xperia XZ2, Xperia XA2 Ultra, and the Xperia XZ3. The devices are available starting now through Friday, November 23, at 4:30PM ET. The Sony Xperia XZ2 features a 5.7-inch display with a 1080 x 2160 pixel resolution, 64GB of internal storage with microSD, a 19MP rear camera, a 5MP front camera, a fingerprint scanner, a 3180 mAh battery and a Snapdragon 845 chipset with up to 6GB of RAM. The handset is priced at $599.99 after a $100.00 discount for Black Friday. You can save an additional $70 off that price by clipping a coupon, which brings the price down to $529.99. The Sony Xperia XA2 features a 6.0-inch display with a 1080 x 1920 pixel resolution, up to 64GB of internal storage with microSD, a 23MP rear camera, dual (16MP+8MP) front cameras, a fingerprint scanner, a 3580 mAh battery and a Snapdragon 630 chipset with 4GB of RAM. Black Friday savings discounts the handset by $60, while clipping coupon discounts an additional $60. This brings the price down to $279.99 (retails for $399.99). The Sony Xperia XZ3 features a 6.0-inch display with a 1440 x 2880 pixel resolution, 64GB of storage with microSD, a 19MP rear camera, a 13MP front camera, a fingerprint scanner, wireless charging, and a Snapdragon 845 chipset with up to 6GB of RAM. The handset usually retails for $899.99 but has been discounted to $849.99. 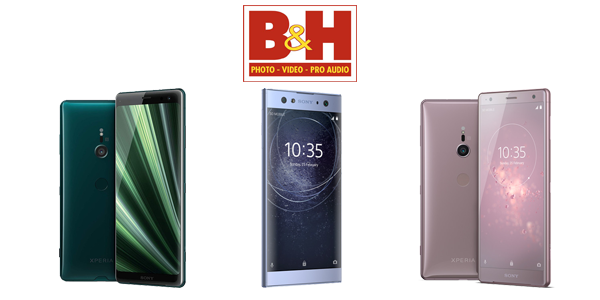 B&H does not charge sales tax in many states, and your purchasing any of these three phones will include free expedited shipping.